How do you Unlock the Rulers? 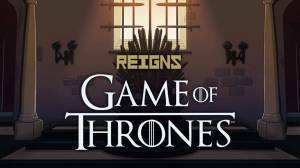 Reigns: Game of Thrones is based on the popular TV series Game of Thrones and like the two previous games in the Reigns series it has swipe-based narratives that steers the plot. Your role is to sit upon the Iron Throne in Westeros and unlock all 9 rulers while trying to maintain rule of the kingdom by doing whatever needs to be done to satisfy your advisors. Attemptinng to please all the different factions will not be easy as you will be faced with infighting and attempted coups. There are four factions; military strength, religious favour, domestic popularity and state wealth. Each faction has their own private interests and to have any hope of pacyfying them it is important that you know how each faction works and what activities anger them. Once you have reached 25 moons and unlocked all the characters you will be faced with the added challenge of surviving Winter and defeating the White Walkers. You rule the kingdom by swiping either left or right to make royal decrees whenever you are presented with a request. Remember though if your decisions disappoint or empower your enemies you will find your rule will come to a quick end. The key to your longevity as ruler of the kingdom is to ensure that there is a balance across all four factions. This does not mean simply satisfying the pleasures of these factions but it also means administering stern judgement to maintain power over each one and not have any of them bask in too much satisfaction. As you progress in the game the you will find trying to maintain each factions satisfaction levels more challenging. There are no time constraints so be sure not to make any hasty decisions you will regret later on. Take your time and read through the lines carefully so you are clear what the immediate and long-term aftermmath of your decisions will likely be. If you hold the screen as you swipe left or right when making a decision and pay attention to the circles at the top of each faction icon you will be able to determine how much they will be affected by it. A decision that will have a big impact will be indicated by bigger than usual circles. It will not however reveal if it is a positive or negative effect. Do not be too concerned when you make a mistake as there will be times it will lead to revealing a unique sequence of events that will enable you to acquire a variety of new cards. Making mistakes will also enable you to garner information which will become useful when dealing with the other characters on your succceeding playthroughs. Check out our guide: How do you Unlock the Rulers? Check out our guide: How do you Survive the Winter? Check out our guide to find out What are Royal Deeds? 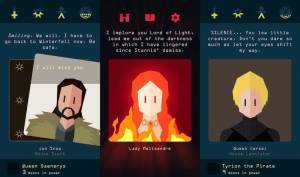 No discussions open for Reigns: Game of Thrones at the moment.